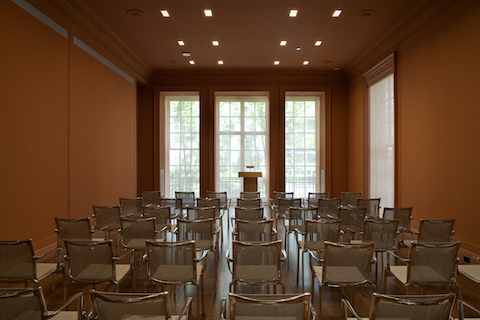 The Lecture Hall holds 100 in theater-style seating or standing reception or 60 seated at round tables of 6. It can also accommodate 6’ or 8’ tables in hollow square or U shape for a conference or panel. Additional breakout rooms are available for conferences and are priced per event. If you wish to request space at ISAW to hold an event, please fill out the ISAW Event Request Form. Please direct any questions and/or follow up on your request by contacting ISAW Development Associate, Maggie Pavao.